How do you Assess Image Quality? What does "image quality" mean for you? What exactly differentiates a "good" from a "bad" image? How can image quality be measured in an industrial camera and which criteria are used to assess it? The best and the brightest graduate and undergraduate university students across engineering disciplines confront a NASA engineering challenge—in this case to build a planetary rover prototype that can navigate simulated lunar and Martian terrains as it performs a series of tasks. Diffraction limit, Modulation Transfer Function (MTF) and MTF curves, and the effects of wavelengths on performance are all critical to the understanding of lens design limitations. This whitepaper, brought to you by Edmund Optics, will explore each of those factors in order to ensure your system offers the best possible performance. Machine vision (also called “industrial vision” or “vision systems”) is the use of digital sensors (wrapped in cameras with specialized optics) that are connected to processing hardware and software algorithms to visually inspect…pretty much anything. Machine vision is a true multi-disciplinary field, encompassing computer science, optics, mechanical engineering, and industrial automation. 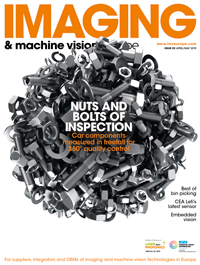 While historically the tools of machine vision were focused on manufacturing, that’s quickly changing, spreading into medical applications, research, and even movie making.